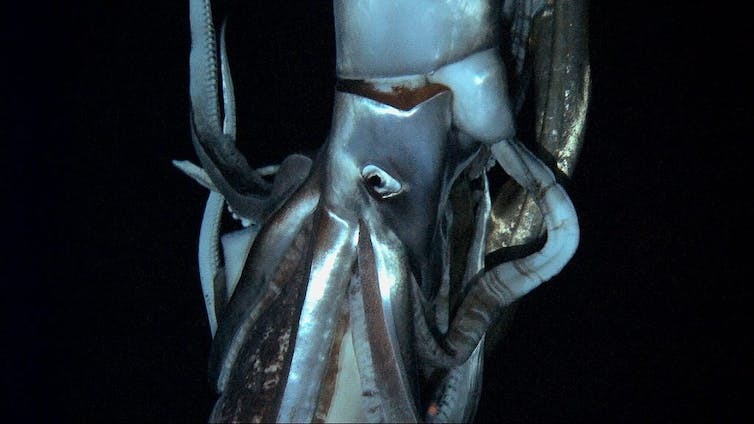 In 2012 scientists succeeded in filming for the first time ever a giant squid in its natural habitat. It’s remarkable how little we know about Earth. How many species do we share this planet with? We don’t know, but estimates vary from millions to a trillion. In some respects we know more about the Moon, Mars and Venus than we do about the ocean’s depths and the vast sea floors. But humans are inquisitive creatures, and we’re driven to explore. Chasing mythical or mysterious animals grabs media headlines and spurs debates, but it can also lead to remarkable discoveries. 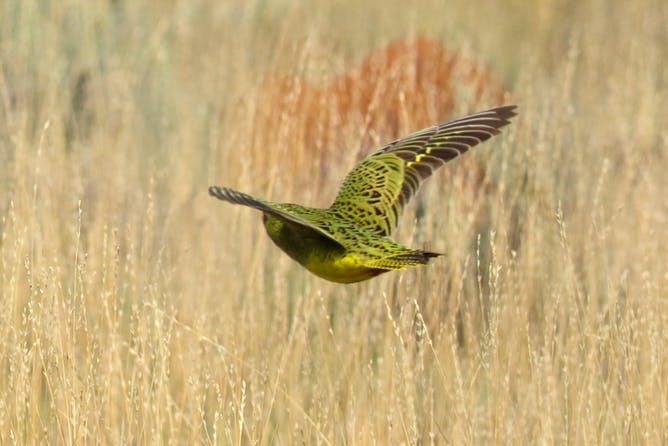 The recent photographing of a live night parrot in Western Australia brought much joy. These enigmatic nocturnal birds have been only sporadically sighted over decades. Another Australian species that inspires dedicated searchers is the Tasmanian tiger, or thylacine. A new hunt is under way, not in Tasmania but in Queensland’s vast wilderness region of Cape York. This is the first photograph of a live night parrot, taken in Western Australia in March 2017. Other plans are afoot to search for the long-beaked echidna in Western Australia’s Kimberley region. In the case of the thylacine, old accounts from the region that sound very much like descriptions of the species raise the prospect that perhaps Cape York isn’t such a bad place to look after all. But in reality, and tragically, it’s very unlikely that either of these species still survives in Australia. For some species there is scientific research that estimates just how improbable such an event would be; in the case of thylacines, one model suggests the odds are 1 in 1.6 trillion. The study and pursuit of “hidden” animals, thought to be extinct or fictitious, is often called cryptozoology. The word itself invites scorn – notorious examples include the search for Bigfoot, the Loch Ness Monster or Victoria’s legendary black panthers. The search for Bigfoot is an extreme case of cryptozoology. Granted, it’s probably apt to describe those searches as wild goose chases, but we must also acknowledge that genuine species – often quite sizeable ones – have been discovered. Remarkable discoveries of animals thought to be fantasies or long extinct include giant squid, mountain gorillas, okapi, Komodo dragons and coelacanths. In some cases, like the giant squid, these animals have been dismissed as legends. 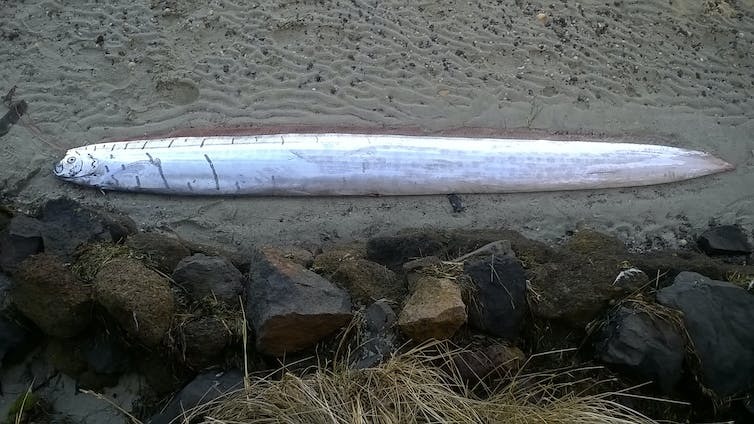 The reclusive oarfish, for example, are thought to be the inspiration for centuries of stories about sea serpents. Oarfish can grow up to 8 metres long and swim vertically through the water. Commonly inhabiting the deep ocean, they occasionally come to shallow water for unknown reasons. Finding rare and cryptic species is self-evidently challenging, but rapid advances in technology open up amazing possibilities. Camera traps now provide us with regular selfies of once highly elusive snow leopards, and could equally be used with other difficult-to-find animals. Candid camera, snow leopards in the Himalayas. Environmental DNA is allowing us to detect species otherwise difficult to observe. Animal DNA found in the blood of leeches has uncovered rare and endangered mammals, meaning these and other much maligned blood-sucking parasites could be powerful biodiversity survey tools. Acoustic recording devices can be left in areas for extended time periods, allowing us to eavesdrop on ecosystems and look out for sounds that might indicate otherwise hidden biological treasures. And coupling drones with thermal sensors and high resolution cameras means we can now take an eagle eye to remote and challenging environments. Drones are opening up amazing possibilities for biological survey and wildlife conservation. It’s easy to criticise the pursuit of the unlikely, but “miracles” can and do occur, sometimes on our doorstep. The discovery of the ancient Wollemi pine is a case in point. Even if we don’t find what we’re after, we may still benefit from what we learn along the way. I’ve often wondered how many more species might be revealed to us if scientists invested more time in carefully listening to, recording and following up on the knowledge of Indigenous, farming, and other communities who have long and intimate associations with the land and sea. Such an approach, combined with the deployment of new technologies, could create a boom of biological discovery. Hi all – I’m on a period of extended leave and during this time I’ll be doing a bit of travelling and having a break obviously.I don’t expect to be back Blogging until the start of September. Enjoy the break – I know I will.